Visit the website of the conference. The deadline for the call for papers has expired. Notifications of acceptance have been sent. Final versions of papers are due for the 1st September 2015. Find here ESHET 2014 Selected Programme for Walrasians. Meeting point: members of the International Walras Association will meet on Thursday 29 May, at 12:00 AM, during the Buffet, in front of Routledge’s table. You are invited to come, even if you are not a member of the association! The International Walras Association is proud to announce the publication of a new collective volume of Walrasian Studies, edited by Arnaud Diemer and Jean-Pierre Potier, and published by Peter Lang (Bruxelles, 2013) : Léon Walras – un siècle après (1910-2010). See the table of contents, and order the book. 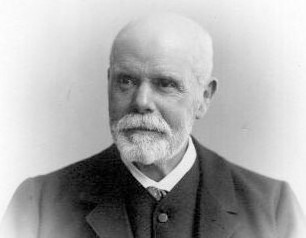 Donald Walker and Jan van Daal present their translation of Léon Walras’s Studies in Social Economics and Studies in Applied Economics, on the Translated works page. 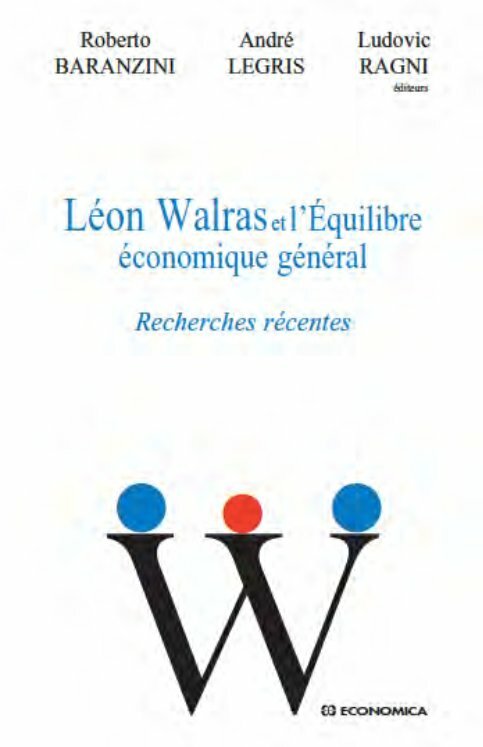 New researches on Léon Walras, undertaken under the impetus of the International Walras Association, are edited by Roberto Baranzini, André Legris and Ludovic Ragni in the collective work Léon Walras et l’équilibre économique général. 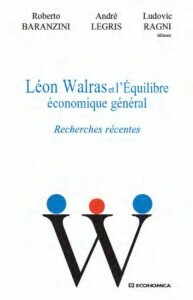 Recherches récentes, published by Economica (Paris, January 2011). Download the flyer and order the book at Decitre.fr. Léon Walras et l’équilibre économique général. Recherches récentes is the second volume on Walrasian studies published under the auspices of the International Walras Association. Etudes Walrasiennes, was edited by Roberto Baranzini, Arnaud Diemer and Claude Mouchot, and published by L’Harmattan (Paris, 2005) and is still available, and can be ordered at Decitre.fr.